Hi everyone! We are off on our much-anticipated vacay this week, and I am so excited to feature in my place here a few friends, both in-real-life and virtual! Up first, a local and all-around fabulous lady, Wendy from Atlanta Events. Wendy's Twitter account, @ATL_Events, is one of the best resources for all that's going on around town. Her update for us today is about an event that I have never personally attended, and I can't wait to check it out. Thanks, Wendy! 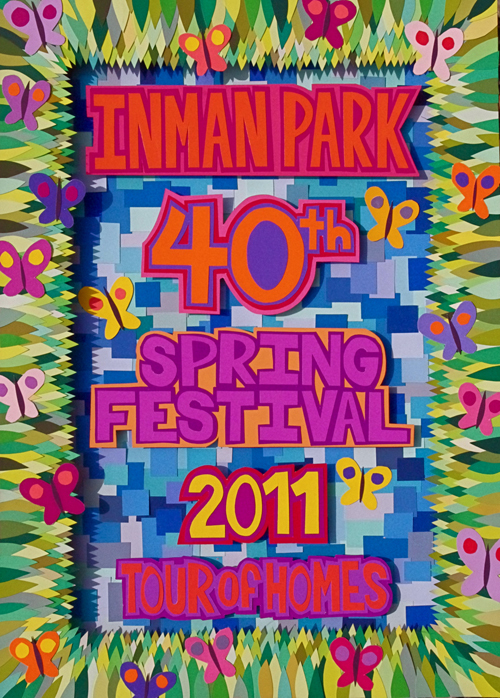 One of my favorite neighborhood festivals of the year has to be the Inman Park Festival, happening the weekend of April 30th thru May 2nd! This free festival is great for all ages. In addition to the arts and crafts Street Market that features more than 250 booths selling handmade wares, antiques, paintings, sculpture and photography, festival attendees can also enjoy live music all day Saturday and Sunday on three different stages. The Inman Park Fest annual Parade is always a huge hit and will take place on Saturday at 2pm, rain or shine! Be sure to get there early to get a good seat. The parade will be led by the Inman Park Butterfly and features the Trash Monarch, Precision Attache Case Drill Team, local politicians, businesses, the Seed & Feed Marching Abominables, as well as other memorable characters from the community. If you want to be in the parade itself, feel free to apply! There are a set number of spaces and it’s first come, first serve with requests. This is definitely a family friendly event. In addition to the parade, there is also a dedicated Kidzone that has slides, obstacles course, games and other fun activities for the younger attendees. Another unique feature of this festival is their Tour of Homes! Tickets are only $15 for the tour, which gives you an inside look at 11 gorgeous homes in the neighborhood. I took my parents on this tour last year and we all really enjoyed it, but for those who have trouble with stairs take note – there can be lots of climbing in these vintage houses! The tour is self-guided, so you can check out the homes starting with the preview on Friday from noon to 4pm, or starting at 11am on both Saturday and Sunday. For those into beer, Shock Top will be pouring again this year. I’m a huge fan of Hefeweizen and Belgium White style beers like Blue Moon, Allagash White and others, and Shock Top hit my radar at last year’s fest. It’s a perfect beer to enjoy on a warm spring/summer day! There will also be traditional fair food around, but be sure to take advantage of all the great restaurants within walking distance of the event – including Parish, Fritti, Pure Taqueria, Victory Sandwich Bar (home of the famous Jack & Coke slushie), The Albert, and Park’s Edge. Or indulge your sweet tooth with handmade chocolates from Cacao Atlanta. For running enthusiasts, you can participate in the Rocket Run and Caterpillar Cruise on Sunday at 8:30am. This 5K is a benefit for Mary Lin Elementary school and encourages creative costumes! The best costume will receive a prize. Little ones can get involved with the Caterpillar Cruise, where 7 team members are joined together as either a caterpillar, Chinese dragon, a train, or other fun themes! Cost to register is $25 and each participant will receive a t-shirt. There are so many great neighborhoods in Atlanta, so be sure to get come and enjoy one of my favorites the weekend of April 30th – Inman Park! Would you consider writing about the Salsambo Salsa Night at Fernbank Museum. Great social event for only $7. Its amazing how many kids are STUCK inside watching TV every day of summer vacation. When we were kids mom would scour the paper for free fairs, puppet shows, plays, exhibits etc so that we had FUN all summer long. Thanks for your post, maybe some moms will be able to RESCUE their kids from the TV this summer!